Unfortunately, I was unable to get an article together for Amievoltaire's Etsy Twitter Team's Shop of the Week ~about a week and a half ago~ and my sincere apologies to Angela, owner and CCO, Chief Creative Officer of this terrific Etsy Shop! So to celebrate Angela's "Shop of the Week" status, I wanted to showcase just a few of her wonderful children's outfits with a bit of Irish Charm. Fabulous items abound at Amievoltaire! 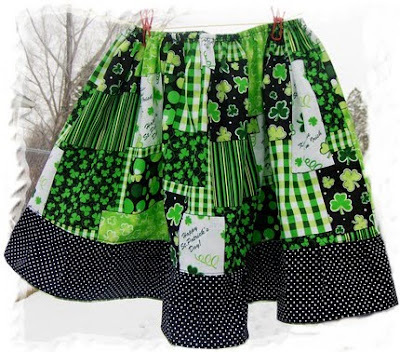 Here's St Pattys Skirt Patchwork Irish Plaid (above), perfect for your daughter that LOVES to Twirl around, doing her best Irish Jig! And we can not forget her favorite doll! 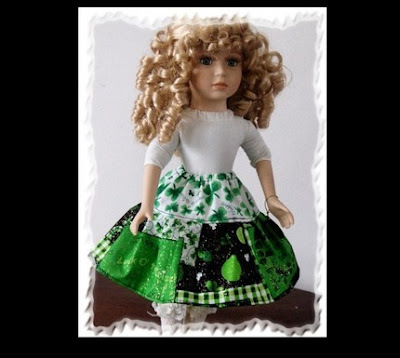 (Below) is a Matching Doll Skirt ~sold separately~ what a perfect way to celebrate the Irish Holiday! Amievoltaire is a shop full of colorful handmade classic children’s clothing with a modern flair. Skirts, dresses, aprons, and even doll clothes are fashioned with bright patchwork and all-girl ruffles. Angela just enjoys designing items that representative of her eclectic personality and love for culture, seasons, nature and tradition. This and so much more is featured on Etsy Twitter Team's Blog of Amievoltaire; where you can learn so much more about this creative shoppe owner. Also, check out previous articles on other team members, as well. You'll find we are a diverse group of artists who just love both tweeting and creating. Here are all of the ways you can get in touch with this Shop!